Baca Architects is seeking enthusiastic and talented Part I, II and III Architects to join the vibrant established London studio, to work on a variety of projects in the UK and abroad. We offer good career progression opportunities in this growing practice. 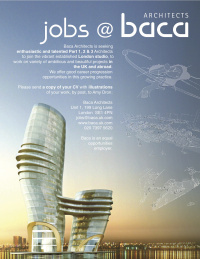 Baca is an equal opportunities employer.